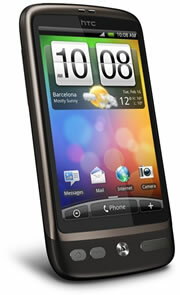 I’ve got bored of waiting for the Nexus One to come out – it’ll be out of date by the time it’s available in Europe! The Desire is pretty much the same, but with physical buttons rather than touch (which have been irritating me anyway on my work device). Good news so far. However, this post is about to turn into a rant. I’m currently with Orange. I gave them 4 opportunities to match the price I could get with Vodafone (including once when they hung up on me). When they couldn’t, I decided to contact them to get my PAC code so that I can change network. I had no problem getting the code, however I was told they have to post it to me – with it possibly taking 2 days to print the letter, then up to another 5 days for the letter to arrive. You’re a telecoms company and you can’t tell me a code over the phone / email it to me / SMS it to me or anything quicker than snail mail? I believe other phone companies can do this, so I don’t know why Orange can’t – sounds to me as an attempt to get you not to bother switching because you can’t be bothered to wait. This needs to be changed Orange! Fortunately, 48 hours later and the letter was with me. Time to purchase the phone from Vodafone then. I decided to buy it online as you get some extra minutes, with the phone being delivered to a store for collection (this solves the problem with me not living at the house where they would have to deliver). Within a couple of hours I’d passed their credit checks and was told to wait for the despatch email. As I was collecting in store, they usually offer next day collection if you order before 3PM. Because of this I was expecting the despatch notice fairly quickly. The next day, when I hadn’t heard anything I decided to look on their eForum and ask on Twitter how long I may expect to wait. It was at this point I found out the HTC Desire was out of stock and they didn’t know when they’ll get some stock in. I couldn’t believe it. At no point in the process (in an email, at checkout online), did they say they were out of stock. It’s pretty poor customer service that they’ve expected the customer to contact them before they are informed of this. If they’d put the information online, I’d have looked at trying to purchase directly from a store (I haven’t checked if any near me have stock, but if so, my other rant would be why they can’t use one of these to fulfil my collection order). Vodafone have certainly lived up to their ‘Power to You’ motto by leaving it in their customers hands to chase up their order status – I think they need to look at improving how they inform their customers of stock levels (how difficult can it be to add a ‘currently out of stock, expected in 3 days’ to a website?). Technically I should be able to pick up my phone tomorrow and it will still be on time (according to their advertised time scale), but I’m not holding my breath as I still haven’t received the despatch email yet. So, how long will I be waiting for my new phone? Not too long hopefully – I’m not sure how much life is left in my old phone! Yes, I’m starting another blog. After trying to make posts daily on my previous one (http://daily.leestone.co.uk) and not really achieving this and the blog previous to that being more of a repeat of interesting news stories, I thought I’d try another. Thoughts not really specific to one of my other blogs, but deemed interesting enough to share with others. There is quite likely going to be a number of rants appearing on here. Posts related to programming. A lot will be there to act as a reminder for myself, but may be useful to others. A variety of topics are likely to be covered in this, along with a little bit of general technology stuff which is still related to coding. Commenting on social media news stories and my opinions on people’s behaviours and thoughts. All of these blogs won’t have any update schedules, instead I will post new articles as and when I feel I have something interesting to write about. As these blogs are created, the links will appear in the sidebar to the right. Currently there you can find a link to ‘The Life of Lee’, which collects any posts or contributions I make in different locations around the internet. The name has come from a phrase I have an unfortunate habit of saying quite often. Plus the domain was available. Simple!